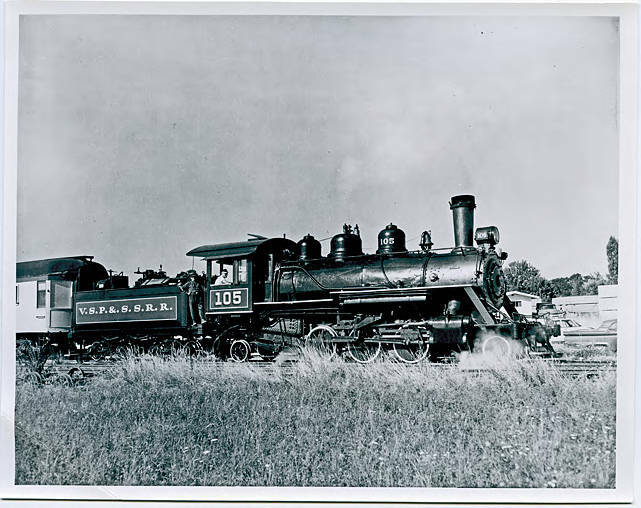 Black and white image of the crew and their engine, #105, of the V. S. P. and S. railroad. The Vernonia, South Park and Sunset Steam Railroad was a nonprofit venture that ran a tourist and excursion train from Banks to Vernonia in the last half of the 1960s. Supposedly named for its first engineer, Chet Alexander, this engine, #105, was built in 1925 and originally pulled trains that transported lumber from mills in Vernonia and Manning. Salvaged and restored for use by the V. S. P. and S. Steam Railroad, the train was In operation from 1965 to 1969, when the V. S. P. and S. folded. The engine was last known to be in storage in Merrill, Oregon. See WCM_012932, WCMpic_012940, and WCMpic_012936 for more images of this train.